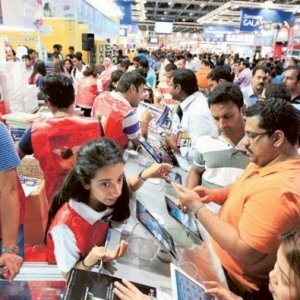 DUBAI: Thousands of gadget fans crammed into the World Trade Centre yesterday for the opening of Gitex Shopper 2013, the largest consumer IT and electronics show in the Middle East. The eight-day event features more than 30,000 cutting-edge products at unmatched prices from top-name brands and retailers. More than 200,000 people are expected to visit Gitex this year. About 120 exhibitors will have exciting product launches and unbeatable offers in the technology, communication and entertainment sectors. It was fitness instructor Ken Tejada’s first visit to Gitex. The 36-year-old walked out with a 39-inch Toshiba flat-screen LED television. “Everyone told me to wait for Gitex if I wanted to buy any electronics, now I know why,” he said. The energy of the crowd was contagious as salespeople armed with microphones kept passersby informed about their special offers and prizes.